This two-storey, classic Caribbean plantation house, with plenty of airy space and one of those deep-blue tiled swimming pools that you can sit and admire all day, nestles in lush vegetation in a convenient location for visiting the island. Callaloo is located close to the white sands of L'Anescoy, with its coral reef beyond, wonderful for snorkelling. Also within easy reach is the island's famous, ocean-side colonial Cotton House, Spa, Beach Café, Tennis Club and Equestrian Centre. 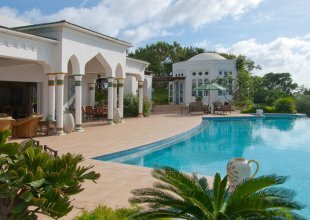 This Caribbean plantation house was built in 1982 and has spectacular views across L'Ansecoy Bay. With its wrap-around verandas and sweeping ocean vistas it provides luxurious and spacious living both inside and out. There are beautiful French louvered doors throughout the villa and serene spaces. Bamboo shades, palm trees and potted plants adorn the terrace and verandas. Callaloo's star attraction is the stunning gazebo next to the pool, an amazing spot to dine on balmy evenings and gaze far out over the rolling verdant hills towards the ocean beyond, with nothing but the sound of the crickets, tree frogs and the sea beyond. 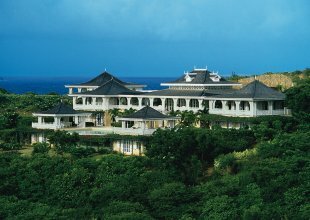 The commanding hillside position of Callaloo sets it apart from many villas and gives it a very special place on the island. Close to activity centres Callaloo is perfect villa for families and friends to enjoy. The cook, Michael Charles aka "Josh" has been at Callaloo since 1992. He created the famous "Grenadine's Crunch" a new granola product which he sells and markets on island - enjoyed by all. He specializes in West Indian fare and Josh's recipes are also featured in the book "A Taste of Mustique" by Kevin Snook and Elizabeth Penniman (forward by Mick Jagger).